Yellowstone has undergone a number of transitions in the 140 years since its national park designation in 1872. The period from the late 1930s through the early 1970s marked one of the most significant as the Park Service shifted focus from public recreation to interpretation and education. The vast wilderness and numerous awe-inspiring natural spectacles of the park became less objects of passive enjoyment and more subjects to be engaged, interpreted, and understood by visitors. The park was transformed from a playground into a classroom where active learning processes could take place. Charged with instituting these interpretive interactions were five remarkable ranger naturalists who served as both protectors and educators. Stephen Biddulph tells the story of the five men, his own father amongst them, tasked with inspiring a generation of visitors to the park. 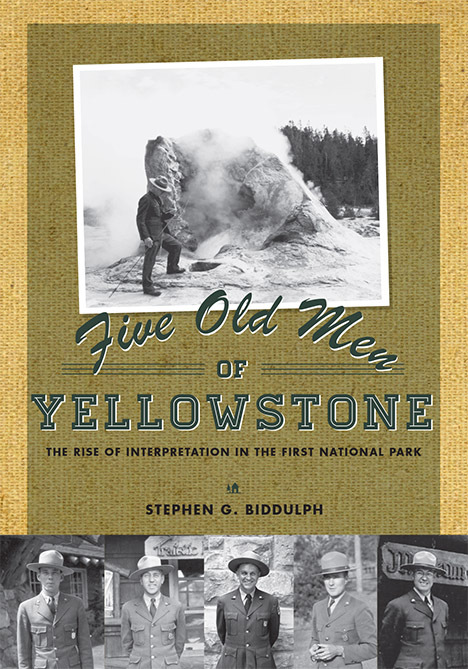 Biddulph’s masterfully woven narrative—part biography, part historical narrative—offers both fascinating factual details about Yellowstone and charming colloquial story telling. The interpretive initiatives of the rangers—nature walks, campfire programs, game stalks, and auto caravans—are enlivened by the colorful personalities of the five men who conducted them. Historians will find that Five Old Men of Yellowstone provides a missing link in the park’s extensive literature, while its humor and sentiment make for an accessible book that will be enjoyed by park history buffs and curious visitors alike. Stephen G. Biddulph, son of one of the “Five Old Men,” spent his first eighteen summers in Yellowstone Park and has been a life-long student of Yellowstone. A retired Marine Corps officer, a Vietnam veteran, and a mental health therapist and drug addiction counselor, Biddulph is married with six children and nineteen grandchildren.